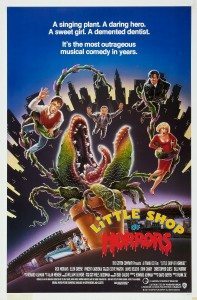 I’m not sure how I’d come across Roger Corman’s 1960 creepy/comic killer plant movie, The Little Shop of Horrors, by the time I was in high school, but I had, and I loved it, and when I heard there was a remake coming out in ‘86, a musical version based on an off-Broadway show I’d never known existed, featuring the likes of Steve Martin, Rick Moranis, and, playing the Jack Nicholson role of the masochistic dental patient, Bill Murray, I was sold. 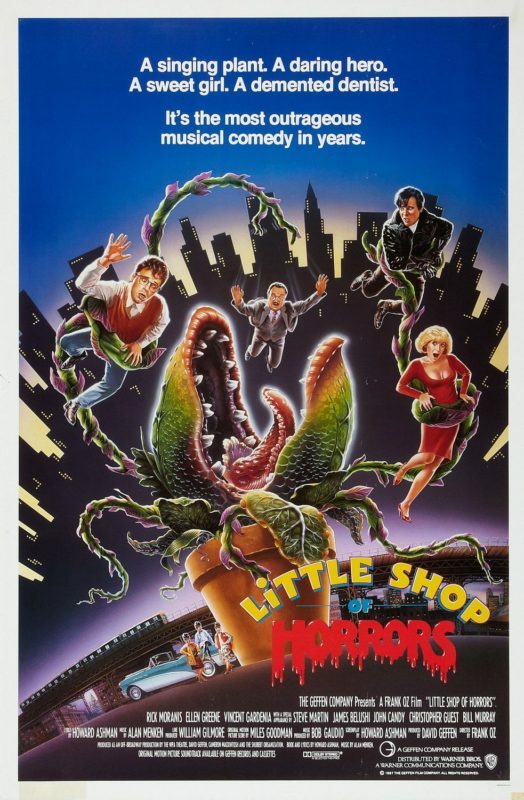 I liked Little Shop of Horrors okay at the time. 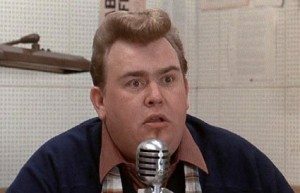 Thing was, I’d never been into musicals or musical theater, so it wasn’t exactly my kind of movie. Plus the happy ending ruined the whole vibe. It rang false. Some nerdy guy effectively murders a number of people and feeds them to his alien plant—and he gets away with it? I must have watched it numerous times back in the day anyhow. I liked the Steve Martin and Bill Murray bits. And the plant, Audrey II, voiced by Levi Stubbs, was incredible. Then I mostly forgot about it for the past twenty years. Which means I never paid any attention to the fact that the theatrical version has a much darker ending, one Frank Oz, director of the movie, shot and showed to preview audiences, who loathed it. Oz, not being some kind of mad auteur, wanted people to see his very expensive movie, and wanted them to like it. Two preview audiences didn’t like everybody dying, so that was that. 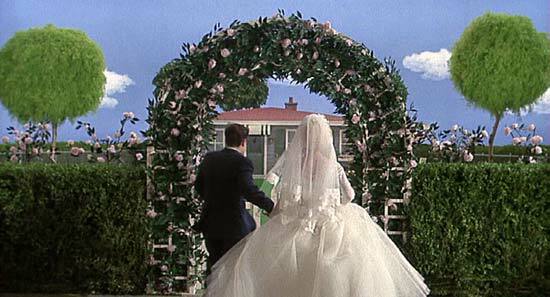 He re-shot the ending we all know, with Seymour killing the plant and living happily ever after with Audrey. The movie was a modest hit theatrically, and a smash on home video. But what about the original ending? It was thought lost until a few years ago. After much restoration work, it was released on the 2012 blu-ray. And still no one told me such a thing existed. What’s the deal, people! I hold you all personally responsible. My lawyers will be contacting you shortly. 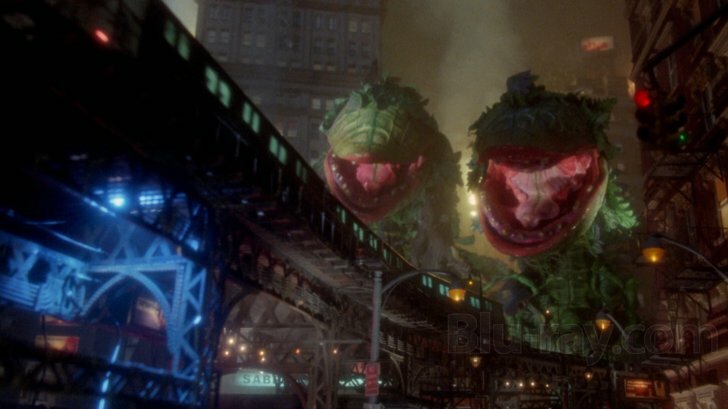 So, a bit late to the party, I saw the the director’s cut of Little Shop of Horrors—a theatrical screening of it, even—and let me be not anywhere near the first to say: Holy plant rampage! What a great ending! First off, Audrey II tries to eat Audrey (Ellen Greene) as in the released version, and as before, Seymour saves her just in time. Then things take a darker turn. As Audrey sings a reprise of “Somewhere That’s Green,” she dies in Seymour’s arms, her wounds too grievous to recover from. 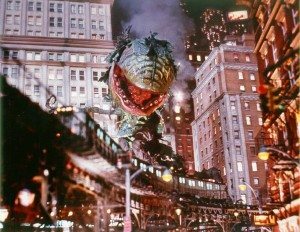 Seymour races to the top of a high building, is about to throw himself to his death, when salesman Paul Dooley (not Jim Belushi, as in the other version), tells Seymour he’s taken a cutting and plans to sell Audrey II plants across the country. 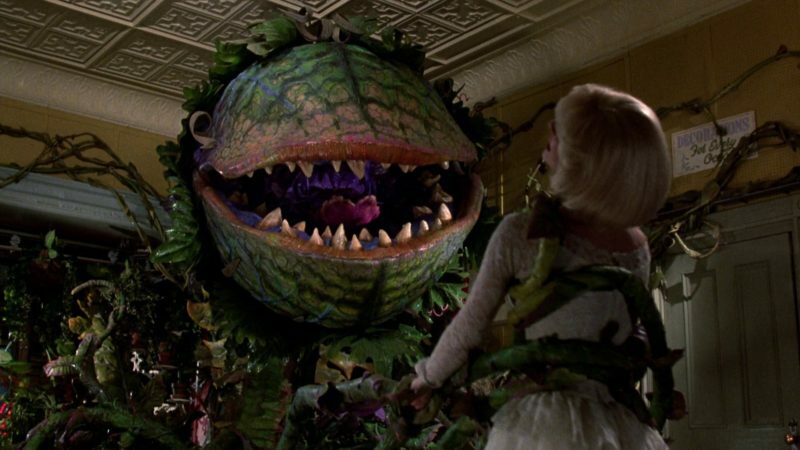 Seymour battles Audrey II as in the original, but he’s no match for an evil spaceplant. Audrey II eats him. Next we cut to our three chorus girls singing about Audrey II’s efforts at taking over the world—we see hordes of shoppers stomping each other in desperate efforts to get their hands on an Audrey II—followed by what is really an absurdly long montage of giant Audrey II plants destroying New York City. The special effects here are fantastic. 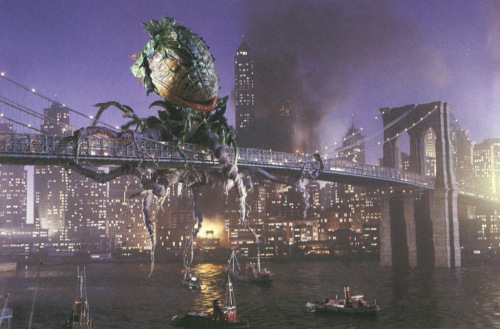 Of course the plants are puppets and the city a model, but this is ’86, the height of practical special effects. And needless to say, Frank Oz knows something about puppets. 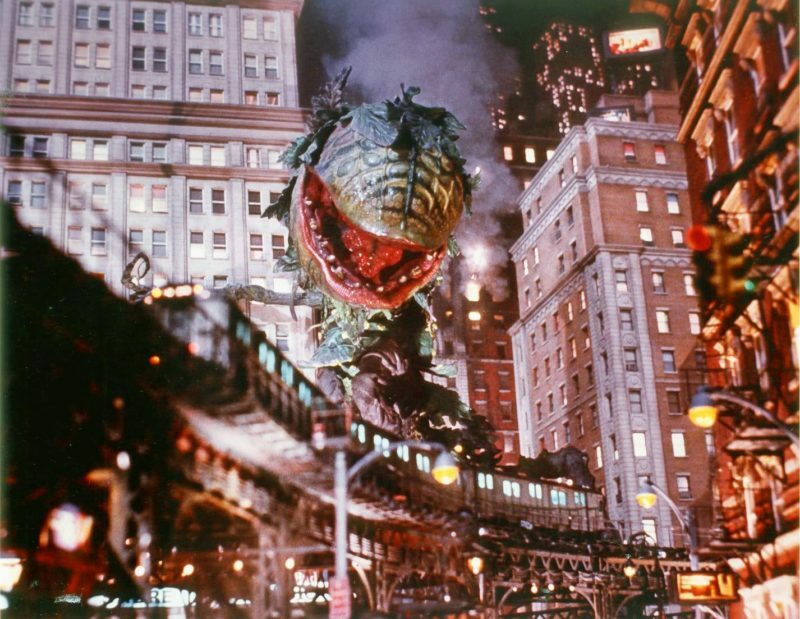 So the plants topple buildings and chase screaming citizens while the army struggles to destroy the aliens. The whole sequence is a perfect throwback to ‘50s science fiction but with ‘80s visuals. We wind up on Liberty Island with the army blasting away at multiple plants crawling over the Statue of Liberty while helicopters buzz past uselessly. The plants have won! The final shot features an Audrey II smashing through the movie screen and opening its mouth to eat the audience. Safe to say I would have approved of this ending in ’86. But no one ever invites me to test screenings. I can understand Oz’s logic. What else could he do? He wasn’t making The Magnificent Ambersons here. Still, it’s a crying shame. The ending worked on stage, why not in theaters? The theory was that in a stage production, the cast returns to take their bows when the shows ends. So in a sense, everyone’s alive and well, and the audience remains happily entertained. In a film production, once Audrey and Seymour are eaten, that’s it. They’re good and dead and they ain’t coming back. Turns out the general moviegoing public ain’t so keen on cute comedy movie couples dying. Personally, I think an alien plant eating the leads would improve almost any movie. But I am, perhaps, in the minority on this one. Thematically, the originally released version has exactly nothing going on. In terms of a moral center, there isn’t one. People inconvenient to Seymour are killed and eaten, and he gets everything he wants. With the darker ending, the murderous Seymour gets his just deserts. His girl is eaten and he is too. Plus another theme emerges: the dangers of unbridled consumerism. Suddenly people like happy customer Christopher Guest are cast in an evil light. Their insatiable, mindless desire for the newest hottest product is what leads to humanity’s destruction. To drive home the point even harder, when the chorus girls sing their song introducing the final section, they sing it in front of a massive, glitter-sparkling American flag. In terms of the rest of the movie, which I’d not seen for so long, I liked it. It’s about as broad a comedy as any I’ve ever seen, in a very musical-comedy kind of way. Everyone hams it up to the extreme. Some of the cast, notably Ellen Greene as Audrey, are able to be both absurd caricatures of human beings, and still resonate emotionally. 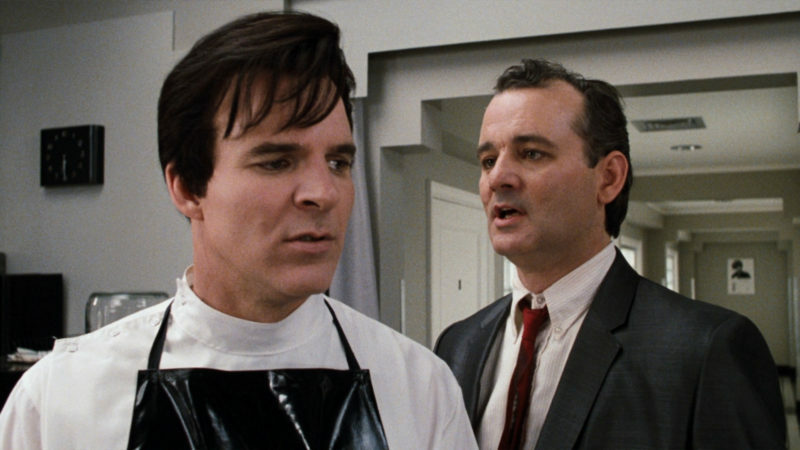 Whereas, say, Steve Martin, as her evil dentist boyfriend, Orin Scrivello, is simply an over-the-top maniac. Rick Moranis and Bill Murray are each in their own ways adorable, and I loved John Candy’s nutty radio host, Wink Wilkinson. Candy has a way of being as extreme as Steve Martin while still maintaining a kind of plausible realism. The real stars, though, are Audrey II and the man giving her (him? it?) voice, Levi Stubbs (of The Four Tops). Stubbs kills it. The songs, the dialogue. His presence is huge. It’s a shame he never worked on another movie. And then remembering this was ’86. It’s all puppetry. 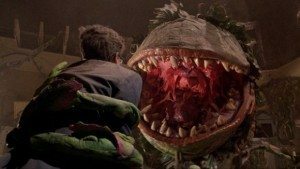 The trick, I learned later, or at least one of them, was to shoot Audrey II at the slower frame rates or 12 or 16 frames per second (instead of 24), which in scenes with other characters required the actors to move and speak in slow motion. Sped up, Audrey II’s mouth moved smoothly and realistically. As for the actors—well done! I never would have guessed. Credit, too, to the catchy and witty music/lyrics by Alan Menken/Howard Ashman (whose first movie collaboration this was). They would of course next go on to save Disney animation with The Little Mermaid, Beauty And The Beast, Aladdin, and progressively lesser lights (Pocahontas comes, regrettably, to mind). 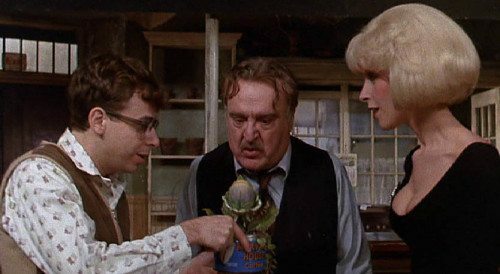 Little Shop of Horrors. It’s right there in the title. Horrors! Killer plants from space! Eating New York City! This is the way it was meant to be. Get your hands on the blu-ray and check it out.